The Screen Actors Guild Award nominations are out, but unfortunately there's nothing all that interesting to report. If it's even possible, the SAGs are even more predictable than they were a year ago and it's disappointing because they're one of the louder moving parts of Awards season. Every year, there's something of a pre-Oscars march. First comes the New York Film Critics Circle awards, which only get the truest of movie nerds abuzz. Then come the Screen Actors Guild nominations, followed by the Golden Globes. Peppered in more quietly are the Writers Guild, Directors Guild, and Producers Guild nominations and awards. It's always been clear that the Globes are pre-Oscars publicity blitz, but the Guilds' awards hold a special place in that these awards come directly from producers', writers', directors', and actors' peers. In this parade of accolades, however, the SAG Awards are somewhat special in that they're actually broadcast for general consumption. The cameras from E! News and every other major outlet come out for the national broadcast event. The fashion displayed at the SAGs isn't exactly on par with the Oscar gown mayhem in February, but it's certainly not a night that goes unnoticed. And in a strange twist of events, while the Academy Awards ratings continue to shrink, the SAGs audience is actually growing. Sure, the ceremony is notable as the only union organization that's able to broadcast its annual awards on national television, but it's also an awards show whose pop cultural relevance is on the rise. And that's exactly why its predictable nominees are so disheartening. 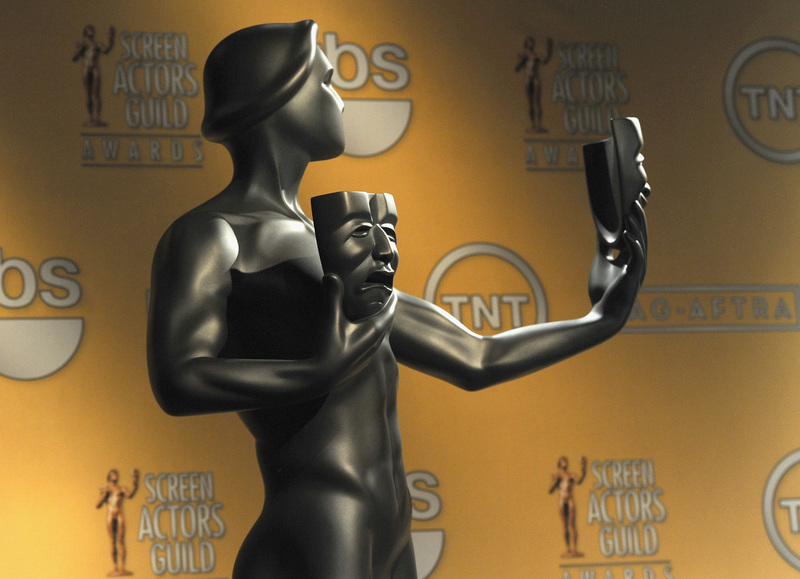 A quick look at the 20th Annual SAG award nominees shows us the requisites — American Hustle (pictured above), August: Osage County, 12 Years a Slave, Dallas Buyers Club, and The Butler for Best Cast in a Motion Picture and Boardwalk Empire, Breaking Bad, Game of Thrones, Downton Abbey, and Homeland for Best Cast in a Drama Series. The other nominees trickle down from there while the best actress and actor categories read like a who's who of everyone's existing favorites in Hollywood. Yes, of course we find Meryl Streep, Jennifer Lawrence, and Tom Hanks among the bunch. Yes, of course, you could overlay the 2012 Emmys with these SAG nominations and see little variation. So what? The problem is that in a wider sense — outside of movie buffs — this is a chance for a wider audience to see what actors working in the industry find praiseworthy. This is where a nomination for someone like Michael B. Jordan in Fruitvale Station, Idris Elba in Mandela: Long Walk to Freedom, Brie Larson (below) in Short Term 12, or even Gretta Gerwig in Frances Ha could go a long way. Yes, there is a thing called the Independent Spirit Awards and they've given accolades to nominees like Jordan, Larson, Julie Delpy in Before Midnight, and Shailene Woodley in The Spectacular Now, but those awards don't reach the same audience as the SAGs — the sheer fact that they air on IFC ensures that. Plus, the Spirit Awards can't help the TV nominees, who are forced to watch Modern Family take both an Emmy and a SAG award home year after year when ensembles like that of Veep and the great 2014 snub Orange Is the New Black deserve to prevail. Now, I'm not saying that in a voting body made up of 2,100 randomly selected SAG members (one group for television and one group for movies) is going to select the potential surprise nominees once it comes time to give out awards. Majority rules and more often then not, the most easily recognizable nominee wins — a quick look at past winners proves that. But where the SAGs could make an impact is in the nominations. Bringing the Spirit Award-only crew and the Emmy rejects (like Parks and Recreation's Amy Poehler or Tatiana Maslany from Orphan Black, who played seven different characters on that series) to a slightly bigger stage could truly help these talented actors find a greater foothold in the industry rather than simply maintaining the status quo by rewarding the Meryls and the Hankses of the world. We all like seeing timeless movie stars on parade — after all, they're timeless because we love them. But for an award that claims to be of the (acting) people for the (acting) people, it sure looks like a slate of awards written by the cool kids. Be bold, SAGs. Give the new kids a chance — even if it's just a measly nomination for an award they're sure to lose to Meryl Streep.